This past weekend the Brevard Zoo celebrated its 20th Anniversary. They also ushered in a new, and highly-anticipated exhibit, Meerkat Hamlet. According to a recent press release by the Zoo, the precocious and entertaining mammals represent a thoroughly different kind of resident than they currently house at the zoo. 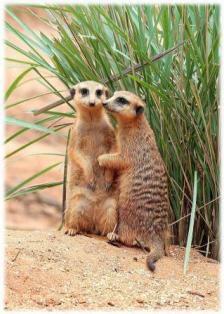 Meerkats are highly social animals in which both males and females pitch in to help educate their young in hunting and survival techniques. Distinguished by their communal nature and extended family living arrangements, meerkats live in multi-generational groups with an alpha male and female. They actively forage during the day while assigning one or more sentinels to remain on the lookout for predators. Their energetic, amusing and charismatic behaviors will be visible for all to see in their new home. Brevard Zoo is an amazing community-built zoo with a unique natural setting, up close and personal animal habitats, interactive exhibits and wide variety of entertaining activities. With over 400,000 visitors annually, Brevard Zoo has since continued to inspire, educate and connect people to the world of wildlife in a way that no other institution can. The Brevard Zoo is open daily from 9:30 a.m. to 5 p.m. rain or shine.